Summary: Researchers have identified a link between visual processing problems and an increased risk of developing a mental health disorder. The study reports the risk for mental illness increases when the visual cortex has difficulty communicating with networks associated with focus and introspection. “We measure how different areas of the brain talk to each other by how their blood flow signals go up and down together,” said Elliott, who works in the lab of Duke professor of psychology and neuroscience Ahmad Hariri. Participants also completed a comprehensive mental health assessment, and the researchers used these assessments to estimate each individual’s “p-factor” score. The p-factor reflects recent observations that people with symptoms of one psychiatric disorder, such as anxiety, are also more likely to report symptoms of one or more additional psychiatric disorders, such as depression or bipolar disorder. In the new study, they wanted to extend this analysis to also include the brain’s functional circuitry. Using an advanced statistical technique, they examined how functional connections throughout the brain related to p-factor scores. They consistently found that people with higher p-factor scores also had certain brain regions that didn’t work together as well — specifically four regions of the visual cortex that help us understand and recognize what we see. Brain imaging reveals that poor communication between four regions of the visual cortex that help process what we see is correlated with greater risk of mental illness. NeuroscienceNews.com image is credited to Maxwell Elliott. “The more we can map the p-factor onto the brain and understand how it influences mental illness, the more we can come up with novel ways of intervening,” Elliott said. Funding: The Duke Neurogenetics study was supported by Duke University and NIH grants R01DA033369 and R01DA031579. Additional support was provided by NIH grant R01AG049789, an Office of the Director NIH award S10 OD 021480, and a National Science Foundation Graduate Research Fellowship (NSF DGE-1644868). Image Source: NeuroscienceNews.com image is credited to Maxwell Elliott. Original Research: Abstract for “A Connectome Wide Functional Signature of Transdiagnostic Risk for Mental Illness” by Maxwell L. Elliott’Correspondence information about the author Maxwell L. ElliottEmail the author Maxwell L. Elliott, Adrienne Romer, Annchen R. Knodt, Ahmad R. Hariri in Biological Psychiatry. Published April 9 2018. Duke University “Breakdown of Brain’s Visual Networks Linked to Mental Illness.” NeuroscienceNews. NeuroscienceNews, 9 May 2018. 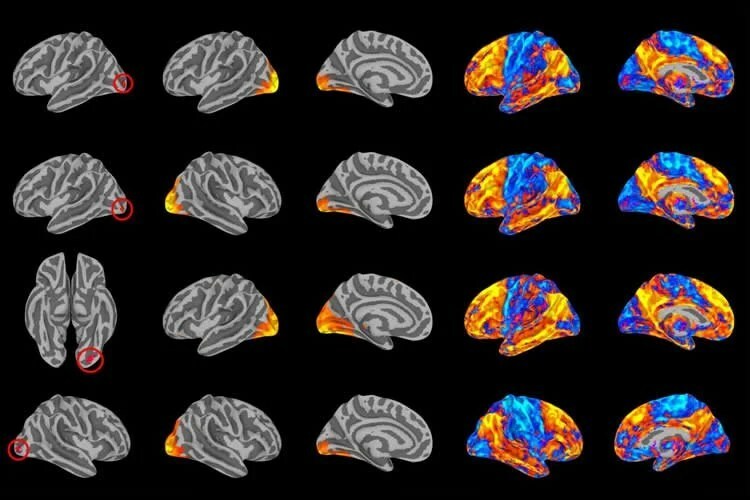 Duke University “Breakdown of Brain’s Visual Networks Linked to Mental Illness.” http://neurosciencenews.com/visual-network-mental-health-9009/ (accessed May 9, 2018). High rates of comorbidity, shared risk, and overlapping therapeutic mechanisms have led psychopathology research towards transdiagnostic dimensional investigations of clustered symptoms. One influential framework accounts for these transdiagnostic phenomena through a single general factor, sometimes referred to as the ‘p’ factor, associated with risk for all common forms of mental illness. Here we build on past research identifying unique structural neural correlates of the p factor by conducting a data-driven analysis of connectome wide intrinsic functional connectivity (n = 605). We demonstrate that higher p factor scores and associated risk for common mental illness maps onto hyper-connectivity between visual association cortex and both frontoparietal and default mode networks. These results provide initial evidence that the transdiagnostic risk for common forms of mental illness is associated with patterns of inefficient connectome wide intrinsic connectivity between visual association cortex and networks supporting executive control and self-referential processes, networks which are often impaired across categorical disorders.